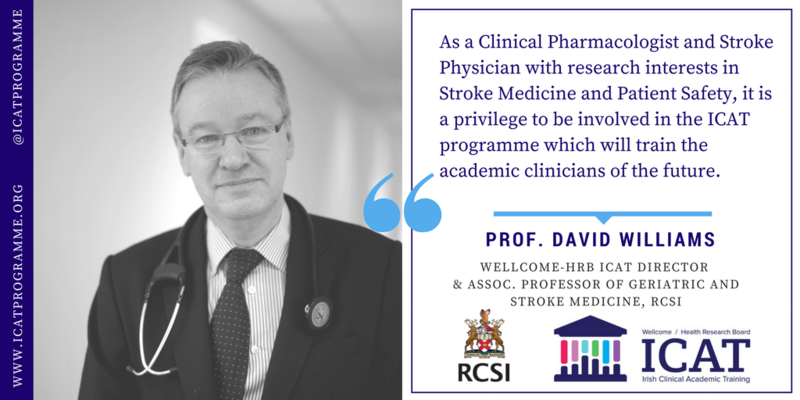 Prof. David Williams is an Associate Professor in Geriatric Medicine at RCSI and Beaumont Hospital in Dublin as well as the National Specialty Director for Clinical Pharmacology and Therapeutics. Prof Williams’ research interests include vascular and stroke medicine, hypertension and patient safety. He has conducted studies in vascular medicine with a focus on arterial compliance and platelet function, and has also examined drug utilisation and prescribing quality in Ireland. Prof. Williams is a Co-Director of the Wellcome-HRB ICAT Programme.